There are birds that are kings of the sky and there are those that consume the dead. There are flightless ones that are cute and adorable and there are also flightless ones that are cultivated and delicious when roasted. Today, we showcase a bird that is rather peculiar on morphology but does not lack on beauty. A flamingo is one bird that a lot of tattoos are inspired from. Both the bird and the tattoo created from it are very recognizable and can be manipulated to define art and uniqueness. Interestingly, flamingo is normally drawn with one foot folded. I actually don’t know the exact history or reason to this approach but for everyone else, the folded foot makes the design more “flamingo”. 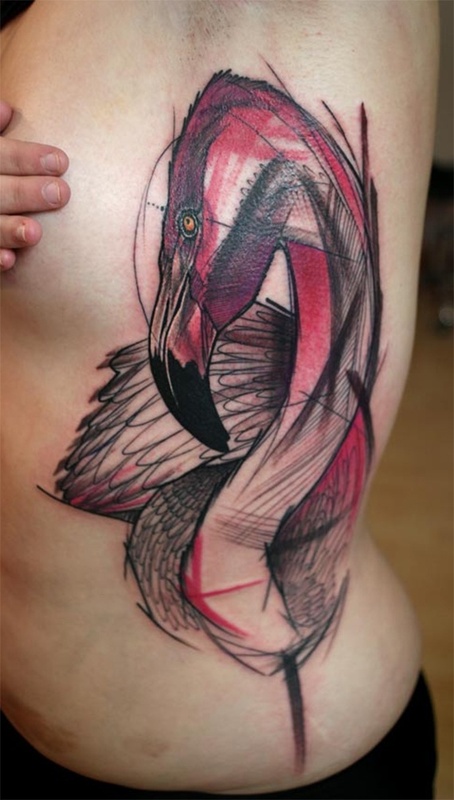 Flamingo tattoos are also considered one of the loud tattoos because of its natural bright pink color. In the natural and real setting, a flock of these pink-colored standing tall birds on a marsh land makes one of the best scenery that nature has for us. I have compiled 40 of the best flamingo tattoos ever created for today’s offering. Showcased are tats that are simple, cartoonish, geometrical, watercolor-splashed, abstract, and cute. Whatever you have in mind, most probably you can find it in here so better to check it now and enjoy early. Visit Amazing Tattoo Ideas's profile on Pinterest. Amazing Tattoo Ideas is the largest collection of tattoo designs and ideas on the internet.